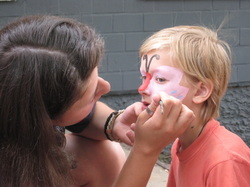 Students from Virginia Tech, led by Kati Williams spent two weeks in Vorzel, Ukraine in 2010 to minister to the orphans. The woman students minister to the children and woman who care for them. The men students work on restoring the buildings, plumbing, concrete, and general building projects. In the Spring of 2011, Kati took her 9th team of 17 from Virginia Tech May 25, to June 9, 2011. In 2010, a desire that Kati had in her heart began to come to fruition. Kati saw a need for a playground and equipment to be constructed for the children. Many people are already partnering to make this heart's desire come true. We are already forming a team for the 2012 trip, July 19 to August 2, 2012. If you are interested in making a difference either by joining us on this mission trip or donating financially to help with trip expenses for the team you can donate on line or send a check to Art is...Creation, Inc. at 1220 Commodore Dr., New Smyrna Beach, Florida 32168. Your donations are tax deductible.